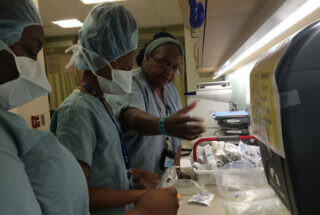 Students at King/Drew Magnet High School of Medicine and Science train at an outpatient center. Great Public Schools Now will give $1.5 million in grants to LA Unified to expand enrollment at a magnet high school and a pilot high school, both in South Los Angeles, adding 1,000 new seats in three years, the nonprofit organization announced Thursday. The intent of the grants is to replicate high-performing LA Unified schools in areas identified by GPSN that are lacking high-quality options. King/Drew Magnet High School of Medicine and Science and Public Service Community School at the Diego Rivera Learning Complex are both among the district’s top-performing schools and are at full capacity. Initially, GPSN had planned to dole out $3.75 million in grants, but the nonprofit organization, which launched in June, only received applications from the district for these two schools. The district also received $20,000 planning grants from GPSN to prepare its applications for the two schools. Last fall, the LA teachers’ union, United Teachers Los Angeles, announced that teachers at four campuses had overwhelmingly voted to reject the GPSN grants. The district had intended to apply on behalf of those schools: Gompers Middle School, Drew Middle School, Pacoima Middle School and San Fernando High School. UTLA took issue with the grant money coming from GPSN funders Eli Broad of The Eli and Edythe Broad Foundation and the Walton Family Foundation, which have supported charter school expansion in Los Angeles. Charter schools operate independently and are free from some state regulations that govern traditional schools. Many charter school faculties are not unionized. King/Drew is a popular magnet program. In 2016, it was named one of the nation’s top high schools by U.S. news and World Report. It enrolled 1,577 students in the 2015-16, according to district data. Downing said the school has a wait list. Public Service Community School, which is on a campus with three other pilot schools at Diego Rivera Learning Complex, enrolled 536 students last school year. It opened in 2011. The district has not yet determined where the expanded programs will open, but Downing said he is committed to opening the programs at existing schools that have extra space within Local District South. The first priority will be hiring principals for the schools, which will be done by the district following district protocols. Once the leadership team is in place, they will study educational practices at the existing schools that are being replicated. “We all agreed that the schools will start stronger if this year is really focused on identifying key personnel and really identifying their capacity,” Castrejón said, adding that personnel decisions for the next school year are already well-underway. The grants will be distributed in $250,000 increments annually to each school over three years, as long as benchmarks are met. The grants will specifically fund design, capacity building, planning time to coordinate with staff at the two schools that are being replicated and to generate interest and enrollment for the schools, Castrejón said. “I think our student population will be a combination of existing students and when we open these new high-quality schools we do anticipate families that might have left LAUSD to come back and take advantage of these opportunities,” Downing said. The district has not yet determined what costs it will incur that won’t be covered by the grants, Downing said. “The core goal of GPSN is to really catalyze and create a sense of urgency and momentum in building these programs that, of course, can and should be sustained by regular (Average Daily Attendance) like every other school,” Castrejón said. She said GPSN will work with Superintendent Michelle King to create a more effective timeline for the next round of grants. “I think there was a lot of interest that didn’t materialize because our timelines were so aggressive,” Castrejón said. Disclosure: The Eli and Edythe Broad Foundation, which contributes to Great Public Schools Now, also funds Spanish translation on LA School Report en Español. A representative of the Walton Family Foundation, which supports The 74, parent of LA School Report, sits on the GPSN board.